A free event for families to come meet local service providers. We host 2 Birth Fairs a year, on the first Saturdays of October and May. Times are from 1 to 5 pm. 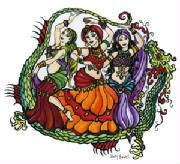 New Moon Oriental Dance Nights! This night is exclusively for dancers and students (of any teacher). This is not a show that is open to the public. RSVP : Let Whitney know you are coming since space is limited. Mellea and Shifah's bi-annual student shows! See up to 4 or more area schools and their students perform! These shows are always fun and receive wonderful reviews. Cost: $10 at the door or $5 if you pre-pay. Videos and dvd's of prior shows are available. Call 413-774-5589 to order your's of previous shows.